Standing outside a polling booth on a freezing federal election morning in 2010, I met a campaigner for the Carers Alliance. He had been at the booth since doors opened and would stay until they closed at 6pm, handing out HTVs he printed using his home inkjet printer. We talked, he was friendly, we both really cared for the plights of carers and people with disabilities. The Carers Alliance did not stand a lower house candidate anywhere in the country, but contested two more states than it did at its electoral début in 2007. In 2010 it achieved its highest-ever national first preference vote: 0.22 per cent. Of course, the party never succeeded, and last year asked the Australian Electoral Commission for de-registration. The carers tried hard, but with little funding did not succeed. Where the Carers Alliance failed, Ricky Muir of the Motoring Enthusiasts Party succeeded. The nation – including Ricky – was shocked when the results came in. “What is this party? Who is this guy? How did he get elected with a primary vote under 1 per cent?” The answer to that last question is “Glenn Druery,” the former professional cyclist who figured out a way to make a buck from Senate group voting tickets. Druery managed minor party preferences through his Minor Party Alliance. This was not an altruistic endeavour – when a Family First client failed to pay up he redirected all their votes to Muir. 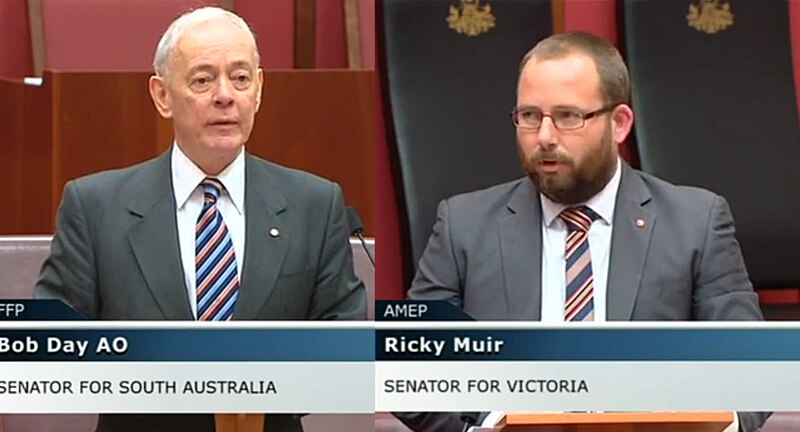 In all, Druery got thee senators up – Wayne Dropulich of the Sports Party (removed in the Western Australia Senate election re-run), Ricky Muir of the Motoring Enthusiasts Party, and Bob Day of the Family First Party. Australia should push for Druery to lead the United Nations – how he managed to get the Animal Justice and Shooters and Fishers parties to share preferences is one of the most stunning negotiations in political history. Above the line voters for those parties would be upset to know their vote was guided by money for a backroom dealer and not by policy. Likewise, I doubt supporters of the three Christian parties Druery had in his deck wanted their votes going to the Voluntary Euthanasia Party or the secular Democrats. Democrats voters would be shocked to hear how much independence their once-great party really has these days. Late last week the Liberal party, the Australian Greens, and Nick Xenophon passed legislation to remove group voting tickets from Senate elections and introduce optional preferential voting. Labor previously supported such reforms but stood against them for political reasons (a chance to bash both the Liberals and Greens at the same time). Bob Day has announced he will take the changes to the High Court, which he hopes will be concerned about “three million votes exhausting or dying deliberately as a result of these laws.” It’s a convenient but flawed argument which overlooks exactly what was happening under the old system and what the new system offers. Day’s election was not on the back of three million intentional votes. Unwitting support for him came from Democrats, HEMP, Bullet Train For Australia, Stop CSG and Voluntary Euthanasia, and umpteen other small party supporters who voted above the line. The reason the votes went to Day was he could afford to pay for them and was willing to morally bankrupt himself for a comfy red seat. The same goes for Muir. Day has said the next election (he assumes a double dissolution after the budget) would be “Death of Democracy day.” Apparently the election of three senators who paid to boost their tiny votes was totally cool for democracy. The claim exhausted votes is in some way less democratic than crazy preferences is also flawed. Only the votes of those not interested in preferencing many candidates will be exhausted, and those are the people who under the old system voted above the line with no knowledge of where their vote would end up. Ultimately, the only key difference is votes for minor (and major) parties now come from people who actually intended to support them. The other big difference with the new optional preferential voting system is citizens who unwittingly screw up their below the line vote still have it counted, enfranchising a huge number of people whose votes would previously be dismissed as entirely invalid. If Bob Day gets his way, the accidental informal voters – people who actually care enough to vote below the line – will continue to have their say completely ignored. It’s easy to look at Muir and think “well, he didn’t turn out as badly as we expected,” but the sneaky and electorally unintended way he stumbled into power was completely undemocratic. Those who put a “1” in a box above the line at the last election entered a lottery, and Victoria was lucky not to lose all its vote money when it landed Muir. Do we really want to risk that again? Do we really want the Motoring Enthusiasts to succeed when the Carers Alliance failed? Day, Muir, other crossbench senators and the Labor party apparently do. Soo, did you actually write this Will? How reliable is the info about Druery and funding for preferences? Agree about the process needing more transparency. That’s why I always vote below the line, even with little knowledge of statements on policies. Yep, I did actually write this. If I ever have a guest writer on the blog they will be clearly credited. The information comes from The Age (see the hyperlinked story at the relative point in the blog), which is usually reliable. Yes, the change to the Senate voting system is an improvement now that I’ve read a bit about it. Especially if it means Bob Day’s days are numbered. This is a quick post in response to the pretty stellar misquotes of Greens leader Richard Di Natale doing the rounds today. When trying to convince the public you are not harming children, most would agree it’s best not to defend Hitler.